Taking into consideration general tendency to improve the environmental situation as well as the fact that some remote areas do not have a centralized power supply, specialists from ZETLAB Company have designed a self-contained power supply system to be used for monitoring purposes in any remote areas. For this purpose, there has been established an eco-friendly system based on solar panels and energy storage units. Thus, it becomes possible to convert solar energy to electricity with industrial efficiency. Special panels used to absorb solar beams are made of high-purity silicone crystals. As the solar light reaches the panel, the sunlight beam strikes an electron from its orbit. Then another electron takes its place. Thus, there is formed a constant moving chain, which, in its turn, produces the current. If it is necessary, the current can be immediately used for devices power supply or it can be accumulated as an electrical power by means of special batteries. 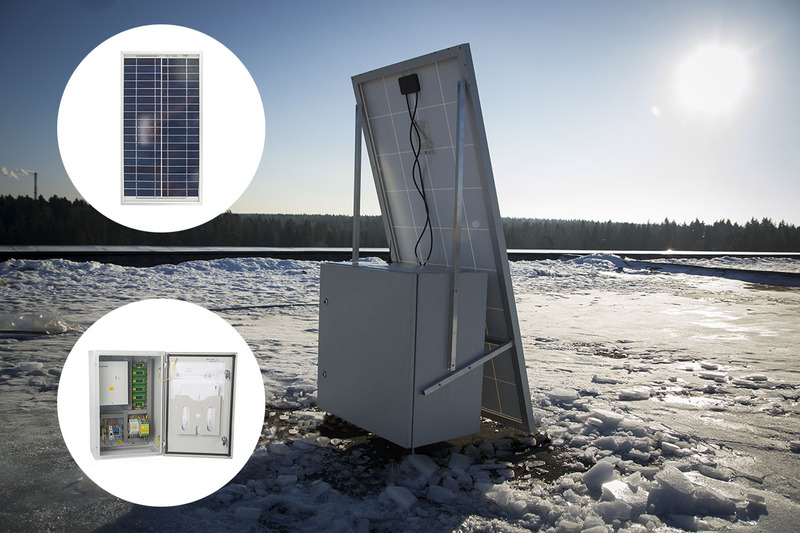 One of the reasons for the popularity of this eco-friendly technology is the ability to gain over 120 W from a square meter of the solar panel surface. Besides, the panels are relatively thin, which allows to mount them almost everywhere. 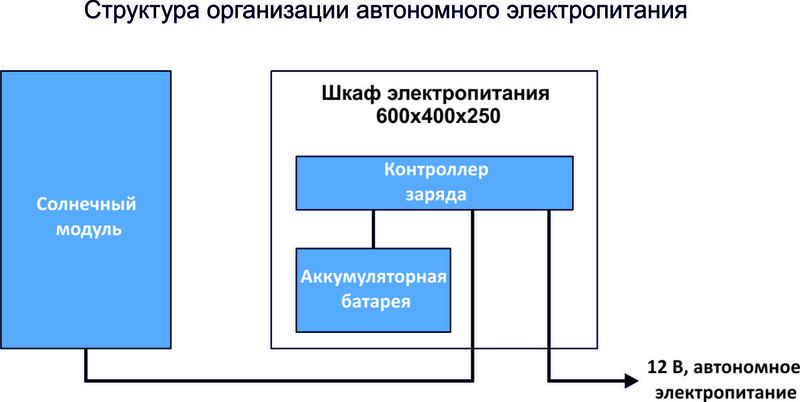 In the figure, you can see a structural scheme of self-contained power supply system. 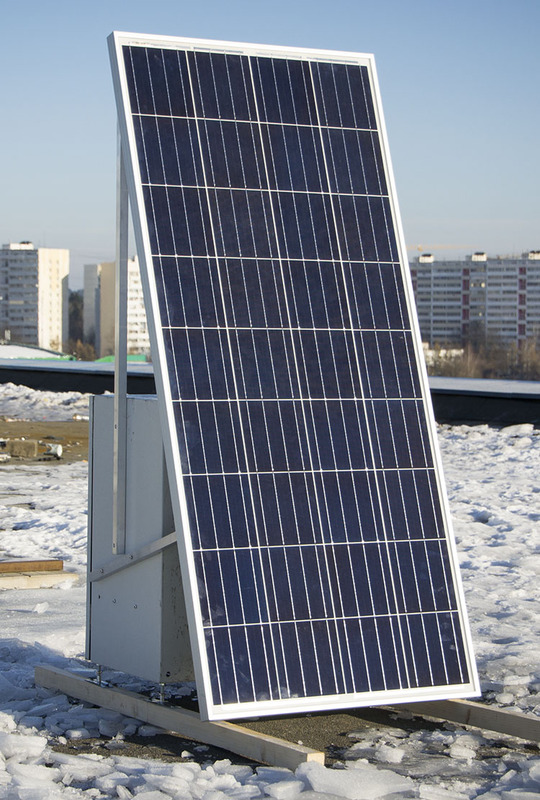 The solar panel is attached to a steel frame with mounting brackets in such a way so that to face the sunlight source. 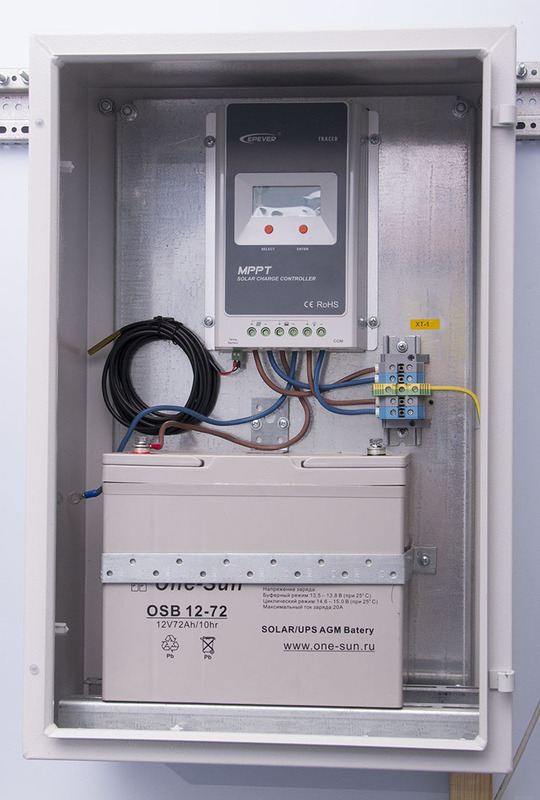 Accumulation battery and charge controller are placed inside of the electrical cabinet (which is placed under the solar panel on a steel rack for control and maintenance convenience). Depending on system structure, amount of equipment and required power rate, one should select a particular composition of the eco-friendly self-contained power supply system. The table below shows options corresponding to various power consumption levels. Using self-contained power supply sources has a number of advantages, besides, such systems will become more available in the future!